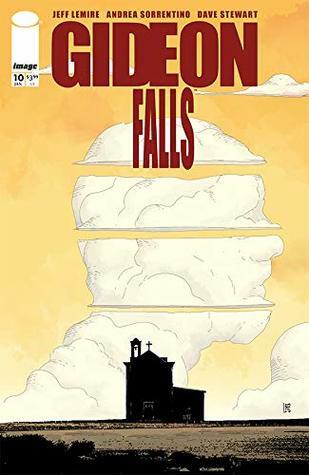 "ORIGINAL SINS," Part FourThe past finally catches up to the present when Doc gives Father Fred a rather gruesome history of Gideon Falls. And if finding a needle in a haystack is impossible, what chance does Norton have of finding one in a giant garbage dump?Hollywood News: Picked up for TV by Hivemind after a multi-studio bidding war with long-time producing partners Sean Daniel and Jason Brown, Bad Robot veteran Kathy Lingg, and former Valiant Entertainment CEO & Chief Creative Officer Dinesh Shamdasani. *Insert incoherent noises here*Just when it seems things are going in one direction, this team raises the bar again. Things are getting real. And this issue has some of the coolest art in a series and creative team known for awesome art.It's all so good! Wow what a series this has been so far and this was the best one yet...simply brilliant artwork and gripping throughout every page!